The most stylish, robust chlorinator in it’s class! 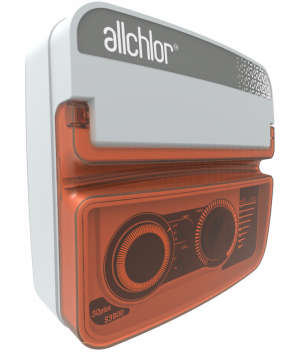 The Allchlor S3800 combines robust, reliable design and user-friendly controls with a sleek modern look to provide unparalleled water care technology. Utilising reverse polarity technology, the Allchlor S3800 is the ideal, affordable, self-cleaning pool chlorinator suitable for most swimming pools. Australian-owned, designed and manufactured using heavy duty components and a premium Allchlor electrode, the Allchlor S3800 is perfectly suited to the harsh Australian climate. RP 30+ and RP 60 also available.